PCPA presents its production of Twlefth Night showing through Sept. 10, Wednesdays through Sundays at the Solvang Festival Theater, 420 2nd St., Solvang. Cost is $40.50 to $51.50 (with discounts for students and other groups). More info: 922-8313 or pcpa.org. I've heard some people say if William Shakespeare were alive today, he'd be a comedy writer working on a hit sitcom like Friends or Modern Family. If you don't believe that, you've never seen his comedic masterpiece, Twelfth Night. The Pacific Conservatory Theatre (PCPA) is presenting the production at the Solvang Festival Theater through Sept. 10. In the play, Viola (Sarah Hollis), who was shipwrecked and lost her twin brother, disguises herself as Cesario in the service of Duke Orsino (Timothy Paul Brown), who happens to be madly in love with Lady Olivia (Karin Hendricks). Cesario is sent to present Olivia with the duke's love letters, but Olivia instead falls in love with Cesario. Olivia's uncle, Sir Toby Belch (Eric Stein), seeks to present Sir Andrew Aguecheek (George Walker) as her suitor but is thwarted by Malvolio (Andrew Philpot), who has a feud with Sir Toby. 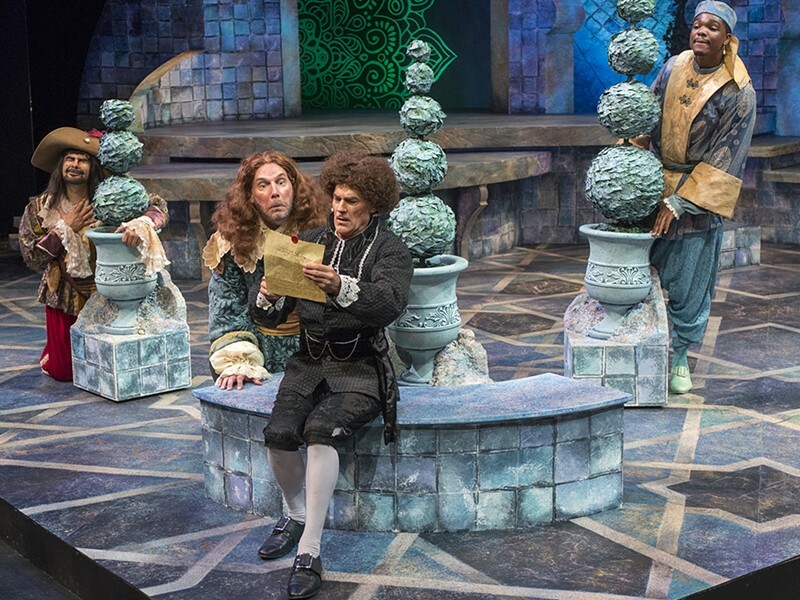 MADCAP COMEDY In a scene known famously as the "gulling of Malvolio," Sir Andrew Aguecheek (George Walker, far left), Sir Toby Belch (Eric Stein, second from left), and Fabian (Chris Mansa, far right) conspire to trick the sinister Malvolio (Andrew Philpot, third from left) into making a total fool of himself in Twelfth Night. The comedy really picks up in the second act, with all of the exposition and plot and character setup out of the way. Here Shakespeare just lets the absurdity run wild, with one case of mistaken identity chasing the next out of the way. It sets off firecrackers of laughter that don't let up until the ending, which wraps up neatly and tightly in a way Shakespeare was stubbornly fond of in his comedies. The best reason to see Twelfth Night is the legendary scene that involves an elaborate con to fool the snivelling Malvolio. In the scene, known famously as "the gulling of Malvolio," Sir Andrew, Sir Toby, and Fabian plot to trick Malvolio into thinking a letter declaring love for him was written by Olivia. When Malvolio, following the letter's suggestions, walks out to present himself to Olivia as her new suitor, you will scream with laughter because the setup is that good. To pull off the comedic timing and physicality of a scene such as this one takes the skill of a highly trained Navy fighter pilot. Truly gifted stage actors can make you forget all the seams holding their work together—the Shakespearean dialogue, the blocking, the suspension of disbelief—until all a viewer is left with is the pure comedic rush of watching three men duck in and out of view from the transfixed Malvolio. Walker brings to life a vigorous fool in Sir Andrew, a knight who is best at jousting glasses of wine. Hollis is magnetic and sympathetic, pulled like a rubber band between the moral dilemmas of her situation. Peter S. Hadres delivers a solidly humorous portrayal for Feste the jester. Director Roger DeLaurier has referred to Malvolio's journey as one of the most difficult, having to reconcile his abominable vanity with reality, in the most humbling and humiliating of ways. Philpot is an excellent choice for every aspect of the performance; his Malvolio springboards from placating servant to conniving conspirator to guffawed buffoon in easy succession. Stein is a comedic star with talents that absolutely explode in productions such as Lend Me a Tenor and here in Twelfth Night. He manages to create a physicality and humanism that lends itself to comparisons with the likes of John Candy or Andy Kaufman. Sun Arts and Lifestyle Writer Rebecca Rose has fallen for many practical jokes in her lifetime. Contact her at rrose@santamariasun.com.